It’s been an impressive year for Chinese railways as the nation unveiled the world’s fastest train and planned rail links from Asia to Europe — and recently the county unveiled its first fuel cell light rail locomotive. 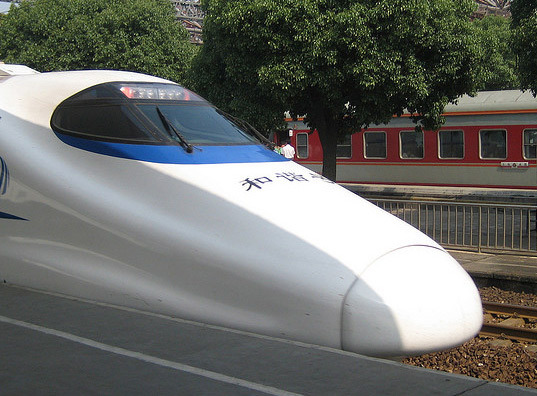 Jointly developed by the China North Vehicle Yongji Electric Motor Corporation and the Southwest Jiaotong University, the train is powered by an advanced permanent-magnet motor and hydrogen fuel cells, which are used to power the synchronous motor and frequency converter. The fuel cell light rail locomotive has many benefits — its permanent-magnet synchronous motor can be used to efficiently generate power while reducing vibrations and noise, yielding a remarkable degree of energy efficiency. The magnetic motor is able to achieve higher performance than regular motors, while still cutting energy use by 10-20 percent. It is expected that the new fuel cell train will provide China with a solution for the electrification of its urban public transportation networks, helping the country wean itself off fossil fuels. The hydrogen-powered magnetic motor train also has a lot of potential for use in the nation’s subways, urban-suburban light-rail railways, and mining links. Rail links play an important part in China’s ever-expanding transit network, so it is crucial to make them as green as possible.